Why Do I Want To Use Relocal Move? We are a full service Real Estate company that has more than 50 years of experience. We have been doing corporate relocations for years and saw a huge need for someone to step in and offer a lucrative relocation benefit, even if the move is a local one. 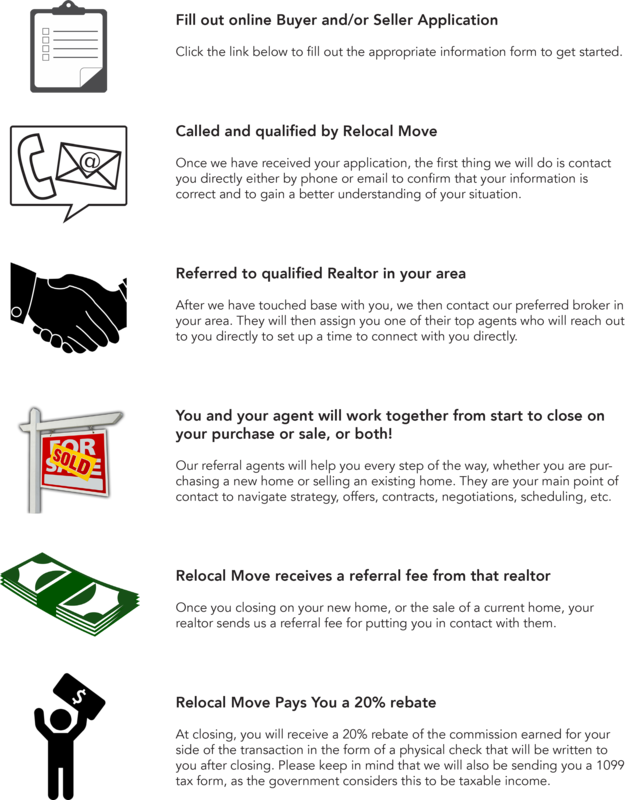 When you use us to buy or sell your home, 20% of the earned commission is given back to you in the form of a check after closing. If you buy a $200,000 home, that’s a $1,200 rebate that comes straight back to you. Please click on the appropriate link below to complete the application. If you are buying and selling, please follow both links and complete both applications, as this will give us a better understanding of your buying and selling needs. We encourage you to visit the “BUYING” and “SELLING” pages before you fill out the appropriate form in order to gain a better understanding of exactly how this process works and what to expect.